Look of the day today on style.com had to do deal with the united kingdom, I chose the main one you see in the middle of this pic, even though it wasn’t the highest voted piece, I just like how the whole design is laid out on the dress. On the site, Style.com (which I visit on a daily basis), they have what’s called “Look of the Day” (http://www.style.com/community/lookoftheday/) where you cast your vote. 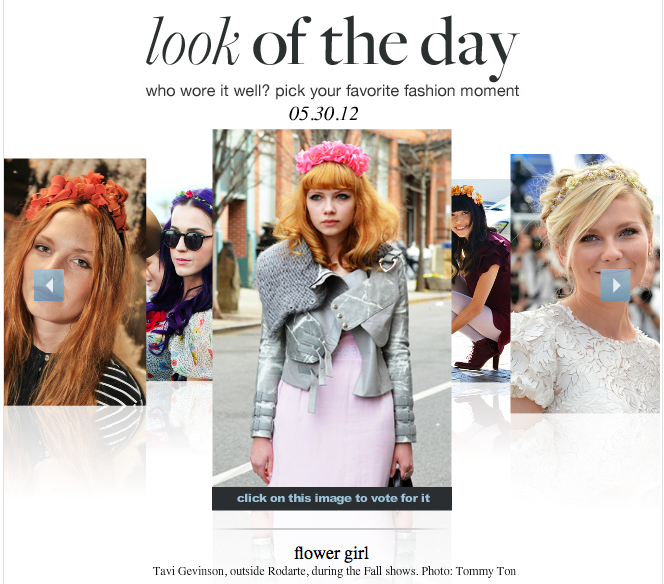 Looks like today’s look has to do with floral pieces in the hair. The one I chose was the bright pink one. Why? It’s bright, big and really stands out in a good way if you ask me. Anyone who knows me knows that I love bright and bold colors! I have attached a screen shot of the one I voted for. What do you all think?